Arriba! I’m back and so is my appetite! In keeping with the change of scenery and the local ingredients, we’re eating a lot of Mexican food – simple, fresh salsa, guacamole, tortillas and crunchy tostadas, chicken tortilla soup and easy enchiladas. I was always intimidated by the enchilada and assumed it was a laborious process, being that it’s technically “twice-cooked” but you can whip up a batch of these in 1 hour, start to finish. Step 1 is to simply season and bake a couple chicken breasts, then shred them using 2 forks. 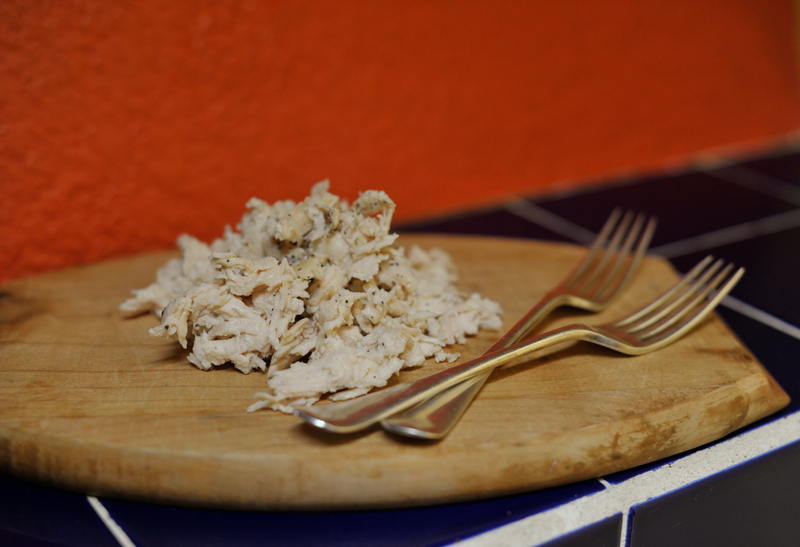 Hold the chicken breast still on a cutting board with one fork and use the other to “scrape” off bits of stringy chicken, until the whole breast is shredded. I get my husband to do this because two forks scraping against one another is akin to the gnashing of teeth for me – I can’s stand it! The texture of shredded chicken is integral to the dish, allowing all the sauce and flavor to permeate the chicken meat, so resist the urge to be lazy and cube the chicken or cut it into strips. Step 2 is sweating the veggies and aromatics in a saucepan for a few minutes, add the chicken and saucy ingredients and cook for a few minutes. 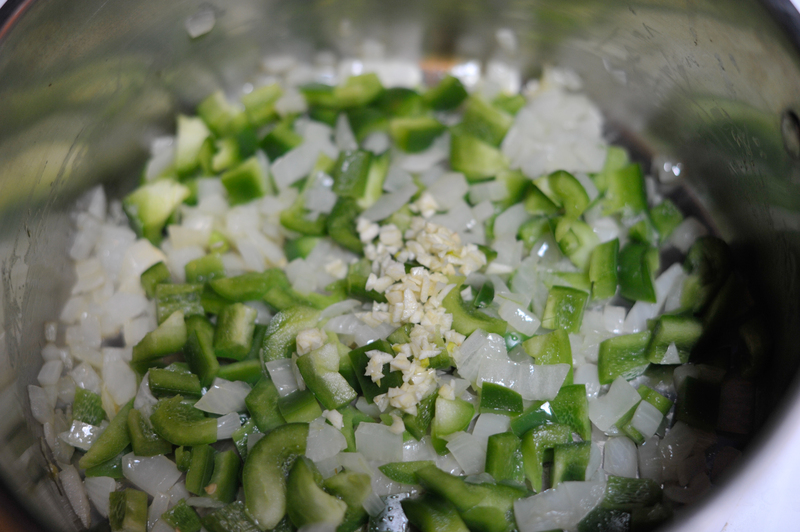 Stuff the tortillas with this mixture and line them up in a baking sheet (instructions in recipe). Cover with a wide swath of enchilada sauce and cheese. At this point you can bake right away or cover and refrigerate for a couple hours (I wouldn’t go longer than 3 hours or you’ll end up with soggy enchiladas). Step 3 is baking the enchiladas until the filling is hot and the enchilada sauce and cheese are bubbling, then serve. Easy, right? Eat the enchiladas alone, or serve with beans and rice, or shredded lettuce and tomato, or salsa and guacamole – whatever you feel like. You’ll notice there’s no real heat in the recipe itself, so the spicy component is going to come from the enchilada sauce you choose. Beware! I grabbed an enchilada sauce of the shelf in a Wal-Mart thinking it would be middle-of-the-road spiciness, since the label didn’t specify “mild”, “medium”, or “hot” (in Spanish, of course). I guess standard enchilada sauce in a Mexican Wal-Mart is “Really F*%#ing Hot”, so keep that in mind. Cook chicken in large skillet or bake for 20 minutes at 350ºF/175*c, cool and use two forks to pull meat apart and shred. 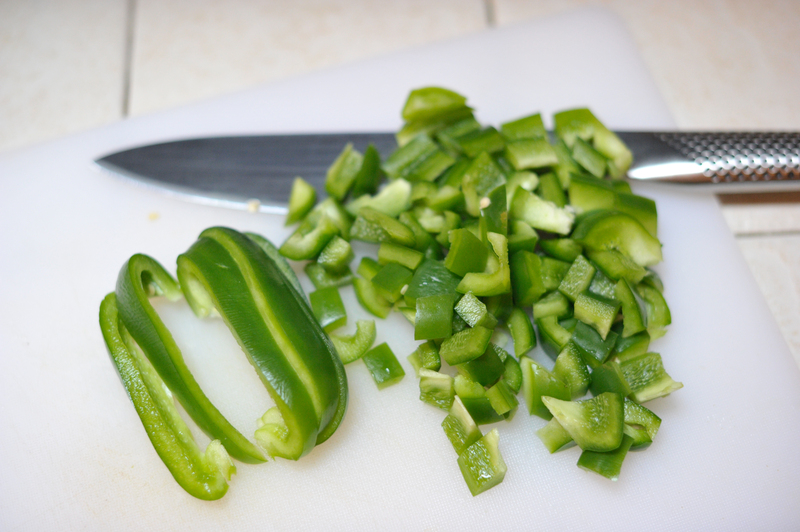 In a large saucepan sweat the onion, green pepper, garlic and oil for a couple minutes. Add chicken and remaining ingredients and cook over medium heat for 10 minutes. 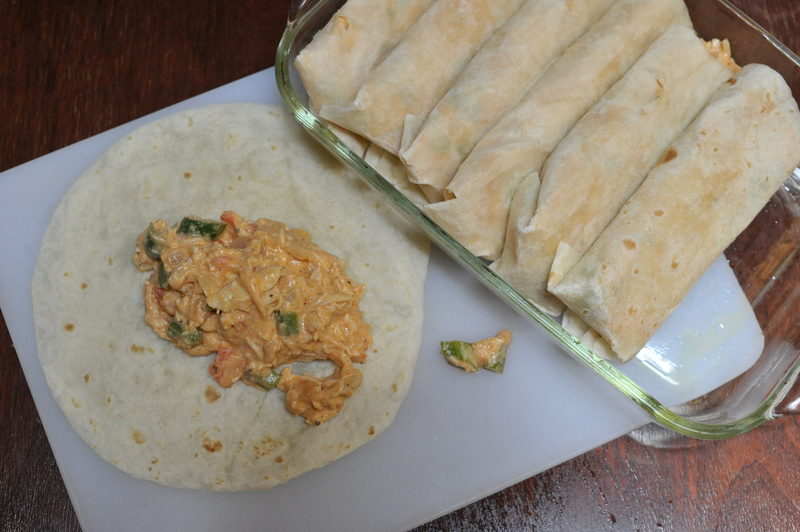 Roll even amounts of filling into tortillas and arrange tightly in baking dish. It’s better to have very full tortillas versus under-filled; otherwise you’ll end up with mouthfuls of dry tortilla. Rolling a tortilla is like swaddling a baby – fold over the right side, then the bottom, then the left side and put this side (with the edges) down in the baking dish so the tortilla stays tightly wrapped. 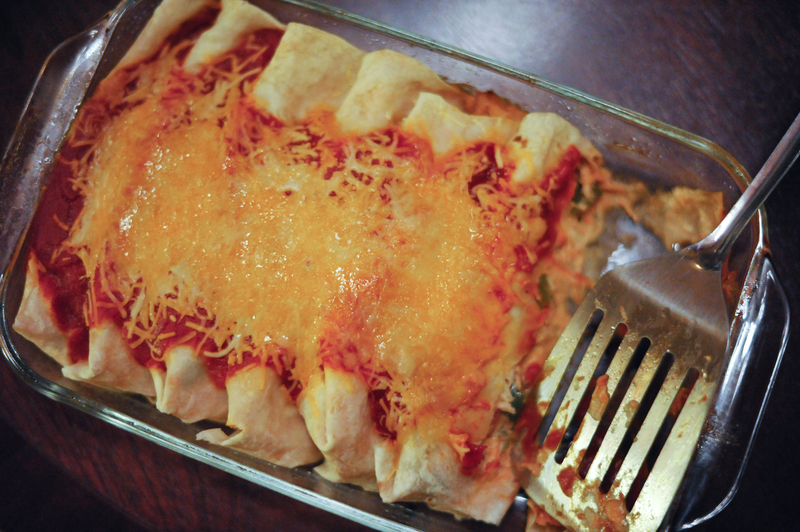 Cover with enchilada sauce and cheese. Bake uncovered in oven at 350ºF/175*c for 20 minutes, then cool 10 minutes before serving. Tags: chicken, chicken enchiladas, easy, enchilada, enchiladas, fresh, mexican, mexico, quick, sauce, shredded, tortillas. Bookmark the permalink. Well I guess these are enchurritos or burriladas! You can go %100 enchilada and leave both ends open, but you will end up with a lot more “lost” filling so I suggest folding one end.